Raising livestock can be a very expensive business or hobby, therefore we are always looking for new ideas that are efficient and can help reduce costs. This fantastic ideas was sent to us by the Smith Family in Ohio and we thought it would be great to share it with you as well. 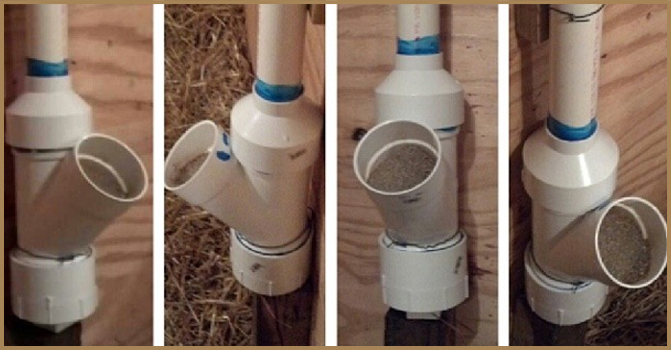 James Smith, owner of Smith Family Farm Boer Goats, assembled this feeder using a 4” wye, a 4” cap for the bottom, and a 2” or 3” pvc pipe to hold the mineral. The total cost to make a feeder like this is approximately $16 and can be assembled in 10 minutes or less. The Smith Family fills their feeder with Concept•Aid® Goat Mineral and feels that the combination of this easy to make, convenient feeder and DuraFerm™ mineral help ensure their goats get the mineral they need to meet their daily nutrient requirements, and obtain optimal health and performance.